The February 2009 comics sales figures are now online here at The Comics Chronicles — later than planned due to various circumstances, but nonetheless showing a market that seems to be hanging in there, at least as compared with the general economy. While losing ground against the same month in 2008, the month nonetheless looks to be in range with many other dead quarter months this decade. Notably, Top 300 unit sales, while down 10% versus last February, were up 5% over February 2004 — and only about a quarter of a million copies below the same category in February 1999. 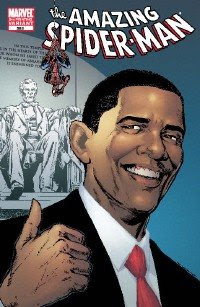 As noted before, orders for the later printings of the Barack Obama Amazing Spider-Man #583 allowed the issue to perform an unprecedented feat in the Diamond Exclusive Age, repeating in the top position. Before February 2003, reorders did not appear in sales charts, but it is possible that X-Men Vol. 2, #1 might have done the trick in August and September 1991. And it was before sales charts altogether, but the reprint waves of Star Wars #1-3 in 1977 seem likely to have allowed those issues to be the top-seller in the market several times. Click to read more about possible precursors. The average comic offered in the Top 300 cost $3.42; the average comic ordered cost $3.41. The trade paperback drop may be deceptive; as Brian Hibbs has noted elsewhere, Diamond's warehouse move in February appears to have taken some SKUs out of play for part of the month. We'll see what happens to the category in March. Additionally, I have made revisions to the trade paperback totals in December and January here on site after catching a necessary correction to the formula. All aggregate totals have been updated. February 2008's top selller was the new X-Force #1, with orders of 105,084 copies in the direct market. Check out the sales chart here. February 2004's top-seller was New X-Men #153, with orders of 113,848 copies in the direct market. Check out the sales chart here. February 1999's top-seller was Uncanny X-Men #367, with orders of 130,872 copies in the direct market. Check out the sales chart here. February 1994's top seller was X-Men Vol. 2, #31, a consensus leader at both Diamond and Capital City Distribution. Capital City alone sold 104,550 copies of the top-seller, and total sales were likely in the 700,000 to-800,000-copy range. February 1989's top seller at Capital City was Uncanny X-Men #245. Capital City sold 74,400 copies of the issue, and archival sources available to The Comics Chronicles confirm the actual sales at 413,600 copies across all channels. Finally, February 1984's top comic book, both at Capital and likely everywhere else, was Marvel Super-Heroes Secret Wars #2, continuing the year-long mega-cross-over.